Involuntary layoffs are likely to follow if the New York Times doesn't get the 100 job cuts it is seeking from a 1,330 person newsroom. The New York Times is about to get smaller once again. The company announced lucrative buyout packages for its newsroom staff this week, in an effort to get its more senior, better paid journalists to agree to leave the company voluntarily. 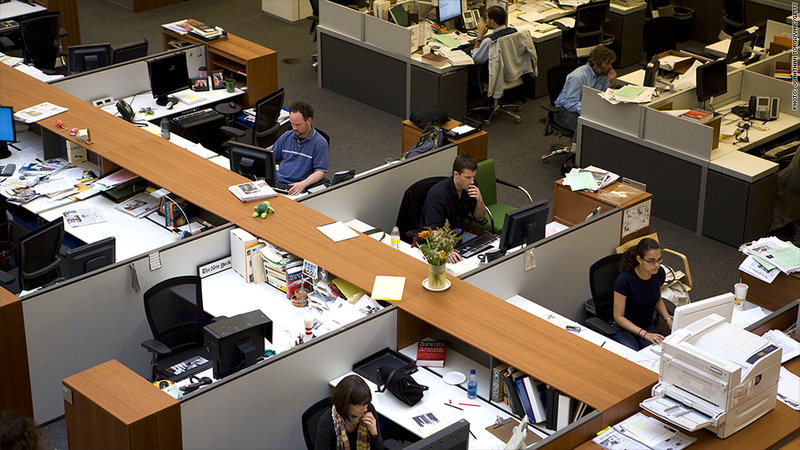 Involuntary layoffs are likely to follow if the company doesn't get the 100 job cuts it is seeking from a 1,330 person newsroom. Buyouts are being offered in other departments as well. The cuts are expected to take place by the end of the year. The company has reduced its headcount by more than half in the last five years. But most of that was due to shedding different parts of the overall business beyond the core New York Times. The biggest divestiture was its $70 million sale last year of the Boston Globe -- a property it paid $1.1 billion for in 1991. 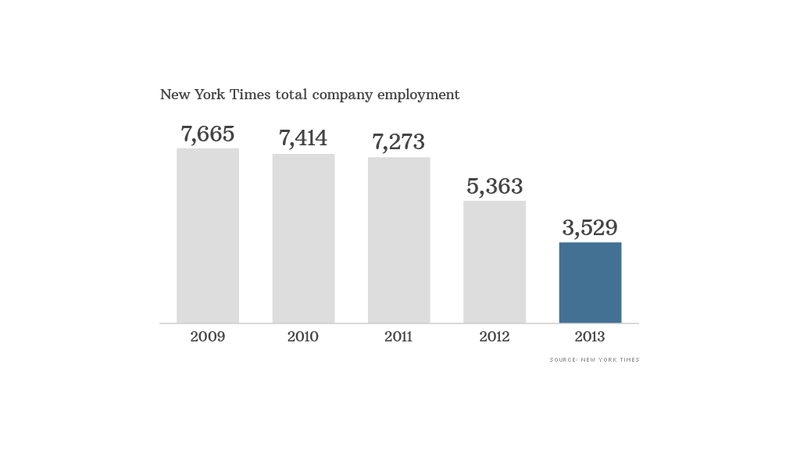 But the Times (NYT) has also cut jobs from across its business units, while trying to limit the cuts in the newsroom. Company spokeswoman Eileen Murphy said digital hiring in the last four years lifted total newsroom staffing by about 200 jobs before the latest cuts were announced. 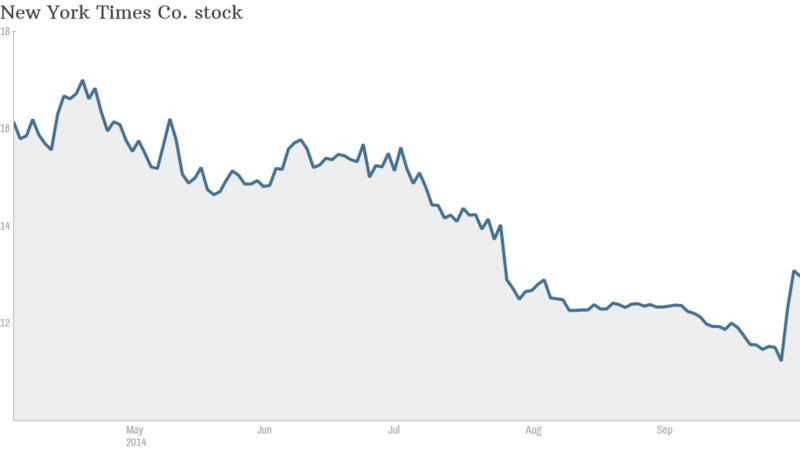 News of the buyouts this week gave a lift to the company's battered stock, which is still down more than 17% so far this year despite the recent bump. But many doubt whether it can really cut its way back to prosperity. Digital revenue growth losing steam: The paper depends on a premium product for its financial success. It is able to charge top dollar for its print edition, and it's one of the few papers able to charge for its digital content. The resulting growth in circulation revenue has helped it overcome the steady decline in advertising that has become a cancer in the print media business in recent years. Circulation revenue jumped nearly 13% after the company instituted a "paywall" for digital readers in 2011. But in the second quarter it reported less than 2% annual growth in circulation revenue, which alarmed investors. While investors generally liked the news of the latest staff cuts, one industry observer said it raised concerns about the paper's ability to hold onto its premium pricing. "People who read the Times will pay anything, and they're the high-income, high-education readers advertisers want to reach," said Ed Atorino, analyst with The Benchmark Company. "But 100 less reporters means less content, by definition. Less content will eventually mean less demand. Sooner or later they will be bumping up against the laws of economics." Industry trends hitting results: The Times company has seen its print circulation fall about a quarter between 2009 and last year, and that slide has continued. It also has cut the size of the print edition, leading to a drop in the amount of newsprint it uses. 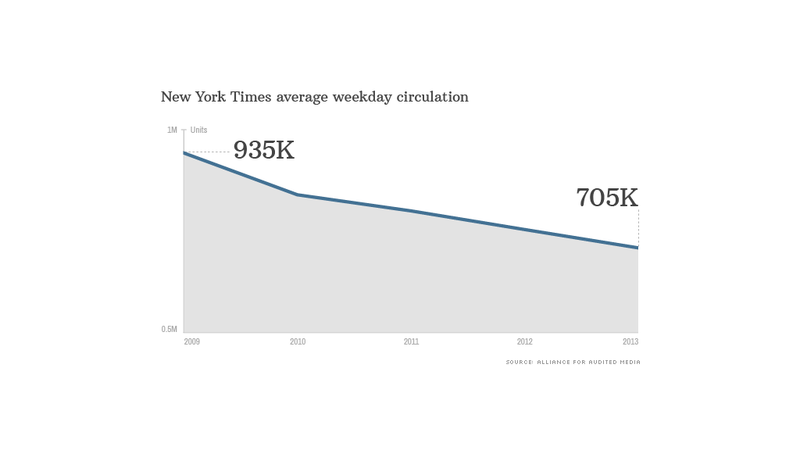 Of course the trend of traditional media losing ground to digital is not unique to the New York Times. Rival News Corp. (NWS) split its company into two last year, separating its papers, including the Wall Street Journal, from its movie studio, broadcast and cable networks that now make up 21st Century Fox (FOX). Time Warner (TWX), owner of CNN and CNNMoney, spun off Time Inc. (TIME) as a separate company earlier this year and recently announced its own buyout offer for employees of Turner Broadcasting, which includes CNN. And many newspapers nationwide have closed or cut back, and are either no longer printed every day or available for home delivery. "They've done better than many papers because they're the Times," said Atorino. But shares of the New York Times Co. have trailed print rivals such as News Corp. and Gannett (GCI), even with the recent lift from the staff cut announcement. Its earnings are due at the end of the month and analysts are forecasting either a loss for the quarter or, at best, break even results.